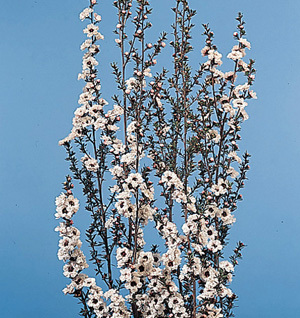 Home|Floral Library|Leptospermum – Leptospermum scoparium and L. spp. Decorative Life: From 3-12 days depending on species. L. scoparium is an example of a species with a short vaselife of only a few days. Choose stems when all buds are fully colored and with 30-50% (or as some say, at least 20%) open flowers. Is a short-day plant requiring 10-12 hours or more of darkness to flower depending on temperature. Store at 36-40 F for up to 2 days dry or up to 5 days in water. Store best under high humidity. Scientific name from the Greek words “leptos” (slender) and “sperma” (seed), referring to the narrow seeds. The specific epithet name “scoparium” means broom-like. The crew of Captain Cook’s ship drank a tea made from leptospermum leaves to ward off scurvy during long voyages, hence the common name “tea tree”. This species is planted outdoors in mild climates or grown in greenhouses. One species (L. laevigatum) is used extensively for the reclamation of moving sands. This family is important economically for many edible fruits including guava, rose-apple, spices such as allspice and cloves, timber (eucalyptus) and many ornamental species. Leptospermum contrasts well with spray roses, stock, peony and other flowers popular for the country look. Useful as a filler or, if stems longer, provides vertical line for contemporary arrangements.